With the SWM withdrawan, Mumbai turns hot and dry on Friday . The Maximum temperature at Scruz was 35.3c, and the minimum humidity was at 33%..Colaba too was drier, but at 60%. Pune was drier at 26%. Parts of Gujarat and Rajasthan were hot today, and regions covered were as The "Pink Shaded" regions shown in the Vagaries' Map. Bikaner was 38.3c, Bhuj saw 36.6c, Surat 36.4c, Veraval 36.1c, Ahemdabad 36.0c, Rajkot 36.0c and Akola 36.1c. Across the border, in Pakistan, Friday was hotter with Turabt being the hottest at 41c. Sibbi saw 39c, Nawabshah and Hyderbad were 38c and Karachi was 36c. Meanwhile, the UAC shown in the Vagaries'map off TN coast will form on Saturday. Chennai will see an increase in precipitation from Sunday night. UAC forming in Off Shore trough off TN on Sunday ..
A anti-cyclone in the upper atmosphere sits firmly over Central India. Getting a 1 day extension, as per Vagaries, the SWM will withdraw from North Konkan (including Mumbai), North Maharashtra, Vidharbha, Rest of MP and UP, and Chattisgarh on Friday 18th. IMD norms would require 3 days of no rain, but we see the parameters get suited for withdrawal, and hence would announce the withdrawal. An UAC has formed off the Sri Lanka and South TN coast, embedded in the East West trough along the line. Friday/Saturday/Sunday: Thunder showers will be active in interior Kerala and adjoining TN districts. Mumbai Gets warm to 35c as SWM withdraws. Outer townships see a dip in night temperatures from Saturday. Pune will see cooler nights at 17c on the weekend. Delhi will remain between 33c and 20c with hazy sunshine. See International Page for Details on Typhoon Wipha, Heavy snow in Austria and Switzerland. Post SWM, we see the night temperatures falling in the Northern plains and Delhi. In the plains, Hissar and Lucknow were 18c, while the lowse in the plains was at Fatehgarh 17.7c. New Delhi saw a low of 20c, while nearby Hindon fell to 19.6c. But the hills are still awaiting a real cold WD. The hills are very much warmer than usual, and there has been no significant snowfall even in the upper reaches of Kashmir, HP or Uttarakhand. We have seen snowfall in the upper reaches as early as end August ! Keylong in HP recorded a minimum of 10c..that is 8c above normal. Kalpa was 6c , 4c above normal and Manali was 8c, 2c above. Srinagar saw a low of 9c, which is 3c more than normal, and Gulmarg was 5c, above normal by 2c and Pahalgam was 4c, above normal by 2c. The IMD is set withdraw the SWM from Delhi on 17th October. SWM is likely to withdraw from Delhi-NCR on 17th October as per IMD norms. This is going to be the longest monsoon season ever in the history of Delhi-NCR with a total of 123 days against a normal of 85 days. 17th October will be the most delayed withdrawal of monsoon ever. Previous last withdrawal date was 13 Oct 1956 and 1959. The Longest duration was in 1956, when it lasted for 111 days. The mighty "Phailin" has now fizzled out into a meek UAC over Bihar. A trough runs South from this UAC, and off the East coast till AP. Another East-West trough has formed East off Sri Lanka. It is expected to strengthen in the next few days, but rainfall will be restricted to Sri Lanka. Interior TN will continue to get thunder showers. 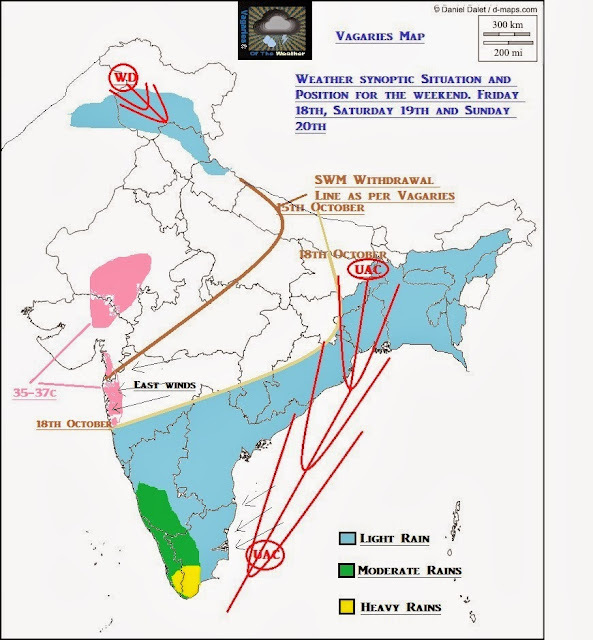 While,as explained in NEM Watch 3, the Chennai region will need to wait till 22nd for the NEM. We are depending on the off shore trough to strengthen and herald in the NEM. The expected UAC should form in the East Bay along the 15N line by Thursday. As expected, outer townships of Mumbai got some thunder showers on Wednesday evening. Now, the SWM can be expected to withdraw from the Mumbai region from Thursday. Nights expected to drop 2c from Thursday night in Mumbai suburbs and outer townships. Pune got some showers on Tuesday, and should reach 17c by weekend. at night we got some showers. Now also it is cloudy and dark in malad. Badlapur had thundering last evening with some traces of rain. Now in morning had light drizzle. finally south west monsoon is set to leave north konkan. some thundery developments in nagothane[raigad].rajesh sir it seems to be cloudy and chances of withdrwal after 19 th. but accu weather forecast shoes that it will again raon around 21-27 october.whst is your opinion ? rajesh sir accu weather forecast shows that it can rain in raigad, ratnagiri districts at around 21-27 october. what is your opinion? Karjat AWS recorded 23mm rain till 5.30pm today. Karjat max temp 32.1c today. While raining at 3.30pm today, temp drop to 23.7c & current temp is 24.7c at 5.30pm. So nice pleasent weather in Karjat now. Finally we in Mumbai can say good-bye to SWM 2013. Waiting for my favourite time of the year - the November to February period - clear days, low humidity that nip in the temperature. Crisp mornings - if you are away from Mumbai in the interiors. Nice. There is possibility of low pressure in Arabian sea by the end of this month. West coast including Mumbai might get some rain because of it. Surat heated up ! Surat max temp 36.4c today. finally monsoon is over..in comes the high day temps..
As observed that , October rainy day's in Mumbai and all over Maharashtra have increased , and the Monsoon nearly get's stalled over MH not withdrawing, atleast not before 15th of October.sometimes these october storms are beneficial to cut down the october heat.these storms should have prevailed till 30th of october. The southwest Monsoon further withdrew from remaining parts of Uttar Pradesh, Madhya Pradesh, Gujarat, north Arabian Sea, entire Bihar, Jharkhand, Chhattisgarh, Vidarbha, Marathwada; most parts of Odisha, Madhya Maharashtra and Konkan and some parts of Gangetic West Bengal, Telangana, north interior Karnataka and central Arabian Sea. Hanamkonda, Gulbarga, Ratnagiri, Lat 17° N / Long. 70° E and Lat 17° N /Long. 60° E.
Monsoon from remaining parts of country during next 3-4 days. Conditions are favourable for commencement of northeast monsoon rains over Tamil Nadu, Kerala and adjoining areas of Andhra Pradesh and Karnataka around 22nd October 2013. Konkan Region: Mumbai heated up ! Santacruz(Mumbai)reported highest temp in whole Maharashtra today. rains in mumbai on 24th 25th and 26th..!!!?? imagine what would happen if low over Arabian sea moves toward MAHA and again monsoon axis moves up??? MAHA already excess we don't need any more oct rains - due to which prices of vegetables/fruits have reached dizzy heights away from middle class people.